LGB, the world's first 'G' scale" train, was born in 1968. However, the family history of LGB goes back to 1881, when Ernst Paul Lehmann founded a small metal fabrication and toy-making company near Berlin in Brandenburg, Germany. 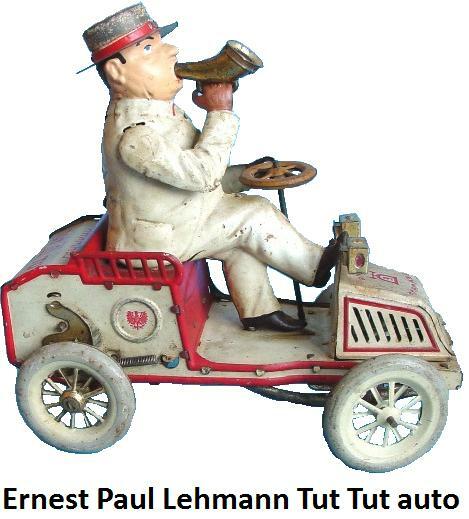 Lehmann had a keen eye for new ideas and his "patent" toys, like the honking Tut Tut auto and flying Ikarus airplane, soon gave "Ernest Paul Lehmann Patentwerk" a worldwide reputation for toy innovation. Lehmann is known for patenting the locking means for the spring drums of clockwork mechanisms. 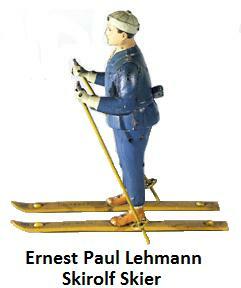 Ernst Paul Lehmann's cousin, Johannes Richter, a merchant and inventor, joined the company in 1921 and built on Lehmann's reputation with patented toys like the ingenious Skirolf skier. Lehmann built up one of the most important and prolific toy-making companies in the world with toys aimed at a mass market. Prices were kept low by using a newly-developed thin and cheap type of tin plate. While the First World War resulted in a decline in the German monopoly of wind-up toys, Lehmann survived. By the 1920's Lehmann employed over 800 staff and produced over 100 different toy designs. These were marketed around the world in boxes with instructions in both German and English. A variety of Lehmann toys made their way to Australia in the early decades of the twentieth century. Lehmann's early tin toys had their colourful finishes lithographed onto the tin plate before being made up with tab and slot construction. Later toys were spray painted and then fired at 120 degrees to give them a smooth enamel finish. Lehmann's trademark was an embossed 'e' surrounded by a bell or his initials 'EPL'. Richter encouraged the addition of toys of a technological nature. After Lehmann's death in 1934 the business was run solely by Richter. During the Second World War the firm suffered from lack of materials and export restrictions but they did continue to operate although production decreased considerably. Nevertheless, Lehmann's did not have to go over to producing military goods as most other firms did and even managed to resist the request to produce politically-approved toys of a military nature. The Lehmann factory buildings escaped war damage and only months after the end of the war were able to resume production at a modest level. Germany was subsequently split into the German Democratic Republic in the east, and the Federal Republic of Germany in the west. Brandenburg was located in East Germany and in 1948 Richter was accused of being a war criminal and profiteer and was removed from the company by the then Soviet occupation forces with no compensation. Lehmann's was nationalised and made into a 'peoples own company' under the name VEB Mechanischne Spielwaren and is said to have become the German Democratic Republics' leading tin toy manufacturer. After the East German government seized the company in 1948, Richter left Brandenburg and moved his family to Nürnberg in the West. In 1950 he and his family built up a new toy firm in a small backyard workshop. Richter died in 1956. A new factory was built on the outskirts of Nuremberg in 1959. With the demise of the tin toy industry, the reformed Lehmann toy company began making plastic toys although they did continue to produce some of the old favourite Lehmann tin toy lines until the 1970's. Then, in 1968, Richter's sons, Eberhard and Wolfgang, introduced the family's boldest invention: LGB- The Big Train. Ernst Paul Lehmann Patentwerk remained family owned with Eberhard and Wolfgang's sons, Johannes and Rolf, at the helm for many years. 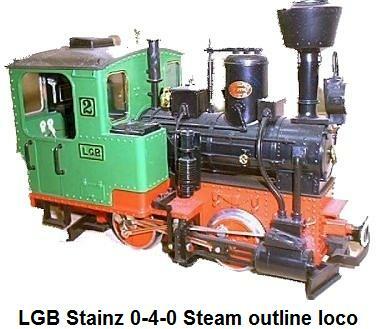 The first loco made under the LGB brand was a model of a small Austrian 0-4-0 named "Stainz". This loco appears in the LGB logo and is still in production today, although it now has a sound system and other mechanical differences to the original 1968 model. Most garden railway enthusiasts have at least one example of a Stainz in their collection as it tends to be a robust loco with good pulling power. Eventually, models of European and US steam, diesel and electric prototypes were manufactured, as well as a large range of coaches, trucks and accessories. LGB's tooling is of great interest due to its design. For example, on the standard 4-wheel coach they have a choice of four roof designs and three body designs, all using the same chassis and end walkway mouldings. Such careful planning allows common parts to be used keeping costs down. Two very different-looking vehicles can share all but one or two components. LGB's engineering is also of similar interest. 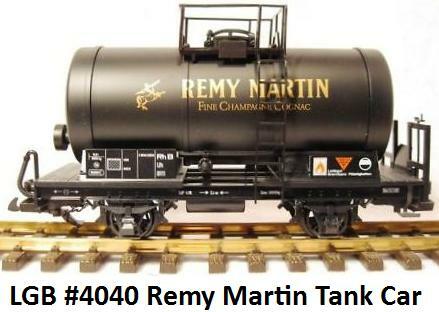 Starter sets typically include a circle of track with a 4 foot diameter and a smaller two-axle locomotive, like the Stainz mentioned above. 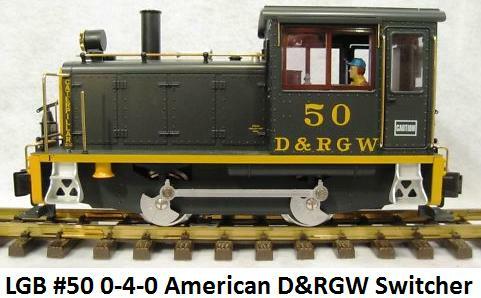 In 1984 LGB released the first model of an American prototype train, the Mogul steam loco. In 1987, LGB opened its American branch in San Diego to provide warranty and repair service to LGB customers in North America. In 1995 the company introduced the “LGB Multi-Train System,” which is a digital system allowing multiple trains to operate on the same track at the same time. In 1997 LGB of America opened a distribution facility in New Jersey. The letters "LGB" stand for Lehmann Gross Bahn which translates to Lehmann's Big Train. "G" scale, which is approximately ½ inch to the foot or 1:22.5 inches is about twice the size of Lionel 'O' gauge trains. Other G-scale (and Gauge 1) manufacturers produce products that range from 1:20.3 to 1:32, and for the most part, all use the same track and are compatible with one another. Although not the largest model scale train, it is the most popular "large scale" train. LGB is the world's first model railroad that can run indoors and/or outdoors. 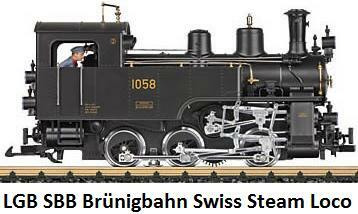 One of the most prominent aspects of LGB trains over other model railroad tains is their durability. All locomotives, track, and accessories of the main product line function in rain and snow allowing nearly anyone to have an outdoor garden railroad. Their rails are crafted from brass. The 'ties' are molded plastic that is weather resistant. LGB is the most popular garden railway model in Europe, although there are also many models of U.S. and Canadian prototypes. 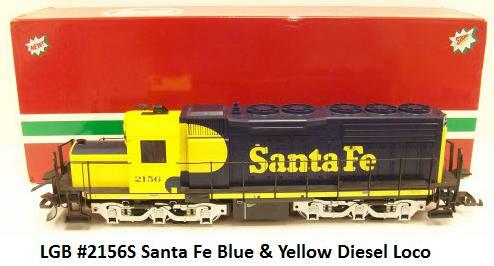 It is also a leading brand of garden model railroad in the United States. For many years, LGB was sold in the United States under the outfit "LGB of America". Many LGBoA products were manufactured in China instead of Germany. As a result of popularity of the LGB trains and a large volume of sales in the United States and Canada, in 1987 LGB of America was established in San Diego to provide warranty and repair service to LGB customers in North America. By 1995 the company had introduced the “LGB Multi-Train System,” which was a digital control system that allowed multiple trains to operate on the same track at the same time. Also in 1995, the first official LGB web site was launched. In 1997 LGB of America opened a distribution facility in New Jersey. LGB train motors run on DC current. Two types of standard couplings are employed on the rolling stock. The majority of the trains come with basic loop and hook type couplers. Conversion kits are available to change to a more prototypical knuckle coupler. In 2001 LGB began to equip its new locomtives with advanced, digital decoders, allowing them to be used on analog or digital layouts without modification. 2006 marked the 125th anniversary of LGB. LGB, Nüremberg, Germany, celebrated 125 years in the business by releasing more than 200 products. The celebratory trains included a complete line of nickel-plated “Ni” track sections; Amtrak locomotives, passenger coaches and freight cars; Disney, Coca-Cola, Peanuts and Wild West-themed rolling stock; a classic LGB Mogul loco featuring a Vanderbilt-style tender; special models to celebrate the 125th anniversary of Ernst Paul Lehmann Patentwerk; models exclusively for LGB Club members; and an easier-to-install model catenary system. LGB's mass-produced offerings for the US market were slightly off-scale and occasionally had adjusted lengths to help the product handle tight curves, but they were built very solid and had an excellent reputation for reliability. LGB had occasionally teamed with Aster or other "boutique" manufacturers to create collector-quality models in scales that were more suited to US Standard gauge (such as 1:32, 1:30 and 1:29). In 2006, LGB of America (LGBoA) was spun off into its own company. Ownership was transferred to a new firm, U.S.-based G45. The new company was headed by David Buffington, who had previously been the publicist for LGB of America. In addition to distributing LGB trains, they also sold Piko structures, and Noch accessories. On September 18, 2006, only a few short months later, Ernst Paul Lehmann Patentwerk OHG (EPL) in Nürnberg, the maker of LGB trains, that had been a family run business for 125 years, declared themselves insolvent and requested bankruptcy protection. LGBoA was one of the companies that bid on the purchase of Lehmann's remaining assets, but lost to Märklin, another German model train manufacturer. Märklin took control of Ernst Paul Lehmann Patentwerk in 2007. Shipping and production resumed in fall 2007, with the LGB brand intact. On September 21st, 2007, an agreement was made between LGBoA and Märklin that gave LGBoA exclusive distribution and service rights in North America. However, a new contract was never signed. Since LGBoA owned the LGB trademark in the United States, new LGB products could not be distributed there without some sort of agreement between LGBoA and Märklin. 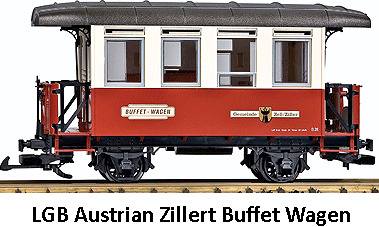 Meanwhile, Märklin continued to distribute new products to the rest of the world. On June 1st 2008, in place of LGBoA a new company named Silvergate Distributors, took over as annnounced by LGB of America president Anthony Castellano. According to a company release, the company would move to a new location in San Diego with "enhanced infrastructure" that would allow it to better serve customers. Silvergate's New Jersey warehouse facility would remain in its current location. LGB of America would continue to exist, but "distribution of existing inventory, current lines, and new product lines would transfer to Silvergate Distributing," the release said. The new company would distribute PIKO G- and HO-scale trains and accessories including a line of UV-resistant PIKO G-Track. New product lines would include Motorart die-cast vehicles and the acquired line of Hillman's RailClamps. Silvergate further diversified with acquired distribution rights of the Schuco line and expansion with Brawa and Piko as its primary model railroad product lines. In November 2008, Märklin announced that it had resolved the American trademark dispute and would resume distribution of LGB products in the United States starting in January 2009, as well as update the LGB websites and release a 2008/2009 catalog. 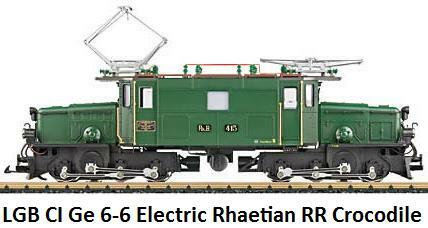 Märklin announced that distribution to the North American market would be through Walthers. This arrangement was not affected by Märklin's early 2009 insolvency. As of April 2009, LGB products can be ordered at the Walthers website.